Angela M. Thomas, dean of health sciences at Vance-Granville Community College, was recently honored with the President’s Leadership Award from Dr. Stelfanie Williams, the president of the college. The honor is one of three Glen Raven Excellence in Teaching and Leadership Awards presented to VGCC employees during each academic year. The others, the Faculty Member of the Year and Staff Member of the Year awards, are presented in the fall semester. Glen Raven, Inc., the manufacturer with a site in Norlina, is a longtime VGCC partner. The company’s support includes sponsoring the annual stipends to recognize outstanding VGCC instructors and staff members, and endowing many scholarships for students. President Williams praised Thomas for her dedication and commitment. “Under the leadership of Dean Thomas, our Health Sciences division has continued to demonstrate excellence in preparing students for successful careers, while also growing with the addition of three new credential offerings, including the associate degree in Histotechnology, as well as new partnerships with four-year universities,” she said. The president added that Thomas had directly led two departments during the past year, along with her duties as dean. In one case, she obtained a certification outside of her discipline (Radiography) in order to take on such a responsibility. In accepting the award, Thomas gave credit to her Health Sciences team and thanked them for their support of her efforts to provide leadership and to assist them with their growth. A resident of Hillsborough, Thomas graduated with an Associate in Applied Science degree in Radiologic Technology from Pitt Community College and a bachelor of arts in Forensic Science from Guilford College, before completing a master’s degree in Health Care Management from Ashworth College. Thomas continues to work as a radiologic technologist at UNC Hospitals. She started her association with VGCC in 1997 as a part-time Radiography instructor, later becoming the program’s full-time clinical coordinator and then head of the program. 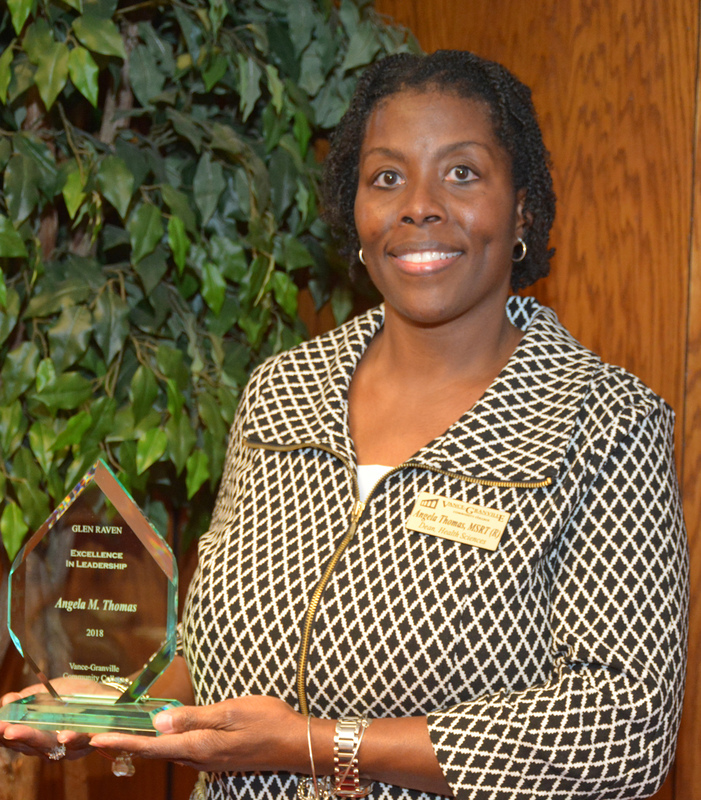 Thomas was named VGCC’s Faculty Member of the Year in 2011. As dean of health sciences since 2013, she leads a division that includes the Histotechnology, Nursing, Human Services Technology, Medical Assisting, Pharmacy Technology and Radiography programs. Thomas is a graduate of the North Carolina Community College Leadership Program and completed the Executive Leadership Program through the College of Education at N.C. State University.